I warned you in my last post, that there would be more FitCapsule items to come…once I got started I just couldn’t stop! Seriously y’all, leggings are like potato chips for me- they both motivate me to exercise, though for different reasons- ha! This part of my FitCapsule (missed part one? catch it here) is crammed full of neon brights and animal prints, and pretty much a throwback to my favorite days in the 80s. Who else remembers scrunching their socks and using a whole can of hairspray everyday to achieve a gravity defying coiffure? Some of my favorite 80s movies include FlashDance, Breakfast Club, and Top Gun, though in the process of writing this post I found so many more listed and am realizing I need to revisit this era of cinematic excellence. Now I know what I’ll be playing in my sewing room as I work on my next few projects! (I can’t be the only one who watches movies while they sew- some lines are lost to the noise of the serger, but it really makes the time go by faster!). I made a total of 9 items for this part of my FitCapsule, focusing again on my favorites- the Power Bra, Inspire Tights (with a twist! ), Lille tank, and a yet to be released layering tank, also from Greenstyle. In addition to the eye-popping neon’s, I tried to include some more basics in black, since I always seem to miss those when I’m hunting in my closet for something to wear under a colorful top. My first set is this neon pink and black Power Bra and Inspire Leggings combo- the original power couple, as far as I’m concerned. The Power Bra here is made using the original pattern, with no modifications except for the exposed elastic on the bottom band. It reads “LOVE HATE LOVE HATE”, which pretty much sums up how I feel about exercise….I hate it when I start a workout, and love it when I’m done. Reminding myself of this fact keeps me coming back to the tread/bike/rower every morning when I’d rather roll over and catch another half hour of sleep, so it felt fitting to use this elastic for this project, which I found at the Flea Market last year in San Diego. The pink fabric is a brushed athletic knit from the Fabric Fairy (similar here). I cut this set out and began sewing it at night, only to realize that I had put the fuzzy “wrong” side out- oh well! The black accents are made with heavy supplex from So Sew English- after reading about the #zerowasteproject in Seamwork the other day, I felt especially good that I was putting those scraps to use toward another functional wardrobe item. The leggings, as you can see, have been modified to lean more toward “joggers”, or as I’ve heard them called- “loggers”. Though I’m pretty sure I wouldn’t catch an actual logger in this bright pink ensemble, so I’m trying to think up a better term for the mashup (got one? drop me a comment). I’ll have a full photo tutorial for how to do this to your favorite pair of leggings on Wednesday- so make sure you’re subscribed HERE! Since there’s always room for one.more. power bra, I made another using some of this uhhh-mazing striped custom supplex from the Styled Magnolia. 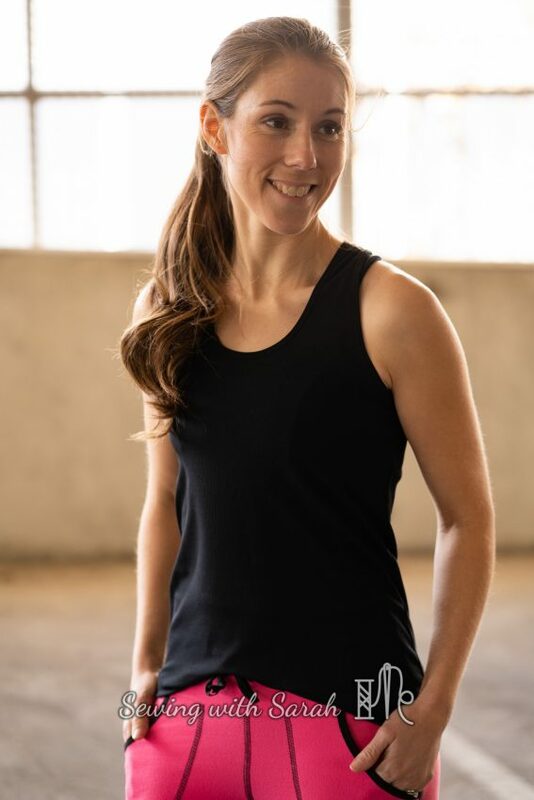 The owner of TSM is an amazing yogi and athlete in her own right, and she brings her sports oriented viewpoint to every fabric she sells, so you know each one is going to hold up to rigorous wear and however much sweat you want to throw at it! I seriously can’t wait for this pre-order to go live…and despite getting some strikes out of it, I’ll probably still go broke ordering all the colorways of this stripe print. Since it’s nearly impossible to find printed supplex fabric out in the wild, I think it’s a good investment in my athletic future. Right? Right. The straps were made using silicone backed elastic from the Fabric Fairy- my favorite power bra time saver ever, and excellent for staying put during HIIT workouts. My next set is made with fabric I received from a So Sew English bundle- I rarely actually make the bundles I receive into a single outfit, but this time I had to go with it- the timing and fabrics included were perfect. The tank is an upcoming pattern, and shows off the back of your Power Bra perfectly (catch the full Sew-Along for the Power Bra here). It also makes a really excellent under layer for tops and sweaters, so make sure you keep an eye out for it on the Greenstyle page! The bottoms are the Inspire tights with the no side seam hack (find that here). This fabric is fantastic, and makes a loud enough statement on its own that I didn’t even feel any extra top stitching was necessary- and that’s saying something for this reverse-coverstitching-obsessed lady. In an attempt to remember that I’m also always needing some black basics in my wardrobe, I made another black Lille tank using my no-fail binding technique for the edges (full tutorial here). That technique has made me love binding all over again, so if you haven’t checked it out and you hate binding, you need to! The fabric for this tank is a really interesting thin ribbed athletic from Mill End in Portland, picked up while we were evacuated over there from the fires (I can ALWAYS find a place to shop for fabric, in pretty much every situation. Its a hidden talent I blame my mother for). I also made a pair of black Inspire leggings, using brushed performance fabric from So Sew English- this stuff is divine, and this time I even managed to keep the brushed side on the inside, so I can feel it when they’re worn. I have a similar pair of brushed Lulu running tights that will be replaced by these Inspires, since my pair fits much better (and feels better too!). I have to admit, I’m pretty proud of myself for making the time to sew these- they’re not flashy, and are about as basic as it gets- but they’ll be in every wash cycle until they fall apart, I promise you. Finally, I made (yet another) pair of Inspires from this fleece backed hex performance (also SSE). I had to add cuffs to these, because they have slightly less vertical stretch than needed, and also because I cut them at the “crop line”- a pretty non-sense move. Who needs cropped fleece leggings? To solve my problem, I cut a pair of cuffs at 85% of the ankle opening, by 6″ tall (2.75″ finished height) and serged them on- problem solved! I think my next pair of legging/joggers will include cuffs as well as front scoop pockets and a drawstring, for the best of both worlds! Well, that’s it- another FitCapsule Challenge in the books. I’ll have the tutorial for the pockets soon, and I’ll be living in these outfits until then! If you made it to the end of this epic saga, please tell me your favorite 80s movie that I might have missed so I can add it to my playlist! Also, a quick side note- if you’re active in the Greenstyle Facebook group, you may (or may not- Facebook was being a $%^& this week!) have seen the post saying I’m stepping down as an official admin. What exactly does that mean? Well, it certainly doesn’t mean I’ll stop sewing, or hacking patterns (especially the Greenstyle ones I love so much). I’ve got lots of video tutorials and blog stuff planned for the future, so this will continue to be an active and fun place to share what I love. It does mean I’m stepping back from helping with the daily work of running Greenstyle- I’ve loved my time there, and have developed some really special relationships, but given some other personal obligations, I felt like I needed to take a step back and let the rest of the awesome team take it forward. I’m excited to see where this blog takes me in the future, and will always be available to answer any questions you might have about pattern construction, etc. As always, thank you for taking the time to hang out in this space, and I look forward to continuing to connect with you! Thank you Rosemary! I’ll still be here for sure!